After it was all said and done, I didn't have a ton of stuff, but I'm so happy with my finds, not to mention I got a great deal on all of it! I debated on this bike for a while. It had this great old basket and old rear-view mirror attached to it, but I didn't get it because of the front tire. My favorite find of the day was one of those old round metal laundry hampers with wheels! I've always loved those, but never have been able to get one until today! After I got back from the sale and was unloading the door (above) from the truck, I realized how monstrously heavy and solid it was and thought, "How on earth did I haul that so far with the carseat?" I've come to the conclusion that I must have been on some kind of junkin' adrenaline rush (yes, sad I know). And now that the day is over and I'm utterly exhausted, I know that I'm a bona fide Junkin' Junky and I'm proud of it! Oh My Gosh,I know exactly how you feel!!! Sounds like a fun trip!Some good finds too. I found you thru a Farm Chicks comment and had to laugh when I read about your search for a wire laundry basket. The exact thing that I razz my mom for having still. She puts summer plants in hers. What will you do with yours? p.s. I love Dafont too. Have you visited the Briar Press site? Thanks so much for your comment! For now I'll use my laundry basket to display pillows and other vintage linens at the upcoming spring shows that I'll be in. After that, I'll bring it home and store my fabric in it. It will be nice to be able to see all the different remnants stacked up because they are stored away right now and I forget what I have. I finally just had time to check out Briar Press and I love it! Thanks for the tip! Great finds!!!! It's always fun to stumble upon a sale that gives you a car load. 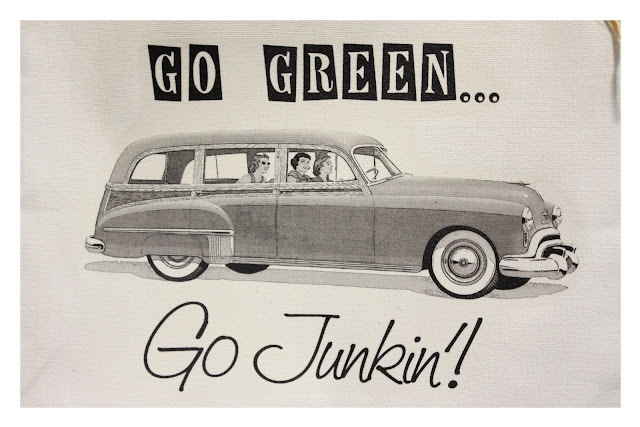 I'm ready for junkin season to start!